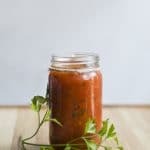 This homemade marinara sauce is made ultra-simply with fresh tomatoes, garlic, and herbs. No cans, no fuss! Heat oil in a saucepan over medium heat, then add garlic and cook about 2 minutes. Add diced tomatoes and stir well. Allow to simmer, uncovered, about 25 minutes, stirring often, until mixture has thickened slightly. Stir in basil, honey, salt, pepper, and parsley (stem and leaves intact). Continue simmering about 10 minutes. Carefully remove sprigs of parsley with a fork. You can serve it like this or puree it in a food processor/blender for a smoother sauce (good for dipping!). Use maple syrup instead of honey to make this recipe vegan. Recipe from Live Eat Learn at https://www.liveeatlearn.com/fresh-tomato-marinara/.